What happened this week was not in my plans. My plans included repairing and painting the cabinet in the master bathroom, while my husband was gone so he did not have to deal with the disorganization. I could have, should have, and would have had it all done, hopefully, before his return and most things back in place, but that did not happen. Monday was Independence Day and I woke up to being called to my herb garden in the cool of the morning, although it was not all that cool. There is a spreading, low growing weed that I finally identified as Virginia buttonweed, and Virginia can have it back! I know it looks almost pretty in the picture I choose to post here, but it really is as invasive as mint and harder to get rid of! I have been fighting against this weed for the last few years that makes me unhappy every time I look out the window or water my plants, so I am determined to take out completely this year, but it is a very tough weed to eradicate. It is nearly impossible without tearing up the entire garden covering it for a year or two and then starting over, but even then...? I would dig it all out and have but it has these runner roots or rhizomes that are three to six inches down, so they are growing even under my stepping stones and borders, and I have found from experience I don't get every bit of them, they come back with a vengeance. I find that the leafy parts pull out easily from the rhizomes so it just grows back. 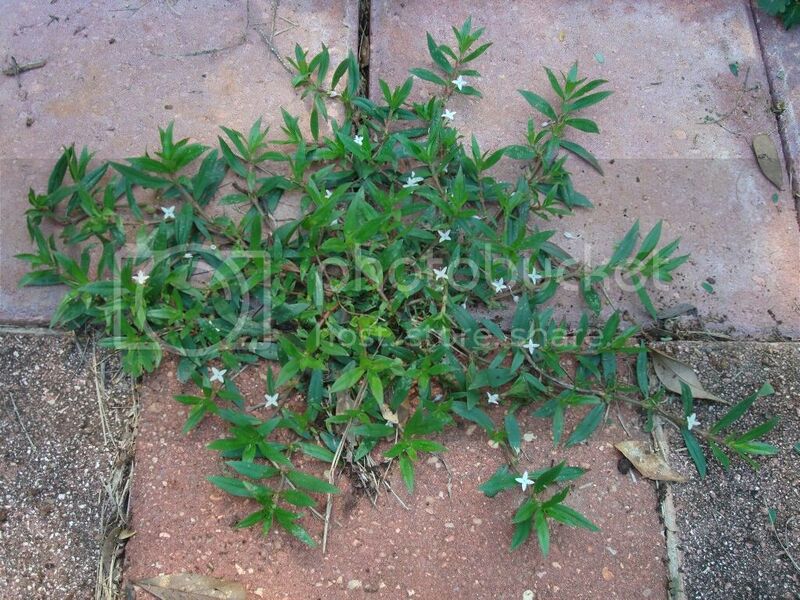 Since I have identified it, I have read that everything I have experienced with this weed is true: Virginia buttonweed can even reproduce from small pieces of the stems or roots. I have had to carefully paint an herbicide on its leaves on the ones in the pathway area were I do not plant the edibles but just pathway fill-in plants that have not completely filled in yet, thanks largely to this weed. That actually worked and they have not come back, as much as I hate using chemicals, between this weed and poison ivy, I have an appreciation of them more now. I was digging out the beds...again! Then laying down a thick layer of newspaper to cut of their sunlight, even though that only cuts them down in the numbers I see and not their roots so does not seem to kill them off. Moving some plants to other areas just because and planting some that have been sitting in pots for weeks. Of course I only got about a third of the garden done, but it is a very good start. While I was working in the garden, I noticed that an area on my neck that was a bit sore the day before, which I thought was from lying wrong, was becoming quite sore. Every time I bent over I could feel it and a lymph gland was swollen, but usually these things correct themselves in a day or two and I ignored it because I was gardening! (Yeah, I really like it that much even though the heat of the day approached.) Later we all ate and went to see Independence Day: Resurgence in 3-D. The neighborhood was filled with fireworks that night. Although less than the night before, it was enough to keep us up later. On the morrow, Tuesday morning, my husband left for the airport to work out of state and I prepared for our errand day, but the Princess had not been able to get to sleep until around 3:00 AM, so she was not getting up even after I woke her twice and then she complained of not feeling well. Then I just gave in and decided that we could try move her piano lesson to another day this week, as it is easier to do now since her teacher has fewer students in the summer. It was a good thing I did because by noon I had a fever. The soreness in my neck was probably an infected lymph gland and now my immune system was trying to fight the infection full on. The fever battled on for the next two days while I stayed in bed for the most part. The fever was not particularly high but the dizziness was quite disconcerting. I do not think I had an inner ear infection, but because this lymph gland was not draining, I believe the inner ear was also not draining fluid, which added to the dizziness and not quite nausea but certainly not hungry feeling. Thursday I had no fever and the swelling had gone down, but I still did not feel up to doing much of anything. I still got dizzy when I was up so I canceled the piano lesson. Today I am mostly fine and annoyed that I made no progress on the master bathroom all this week, but I hope to do a few things today. I am thinking of painting a bit of herbicide on that bottonweed and looking forward to welcoming home my husband. My Lord, thank you for the days of good health so that I can garden, and work my house as I tend to take it for granted.